Hospice House Driveway Replacement and Drainage Improvement Project: $25,000. Habitat for Humanity House (being constructed at the Warren County Career Center to be located at a site on Beech Street) – $10,000. Students Against Destructive Decisions (A grant in support of the organization’s annual conference in Warren) – $1,000. St. Joseph School Scholarships for families needed assistance in sending their children to the school – $12,000. Second Harvest Mobile Pantries & St. Joseph Christmas Baskets for needy families – $15,000. Volunteer Training for CASA (Court Appointed Special Advocates who support children who are in the legal system) – $15,000. Hospice of Warren County (General support for the Hospice House, Membership in Hospice, Palliative Care Support) – $20,000. Warren General Hospital (Dare To CARE — Cardiovascular Arterial Disease Education Campaign) – $25,000. Struthers Library Theatre Capital Campaign – $50,000. 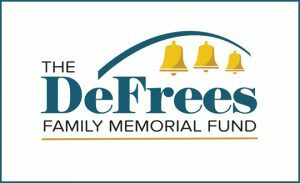 The DeFrees Family Memorial Fund Oversight Committee meets monthly. Grant application forms can be obtained by contacting the Community Foundation of Warren County office. The completed forms should be mailed to P O Box 691, Warren PA 16365. Applications must be received two weeks in advance of our meeting in order to be considered. Dr. Howard R. Ferguson, Jr. is the Chairman of the Oversight Committee and Elsa Redding serves as the Vice Chairman and Secretary. Other committee members are Robert Crowley, Stephanie Freitag, Dennis Hedges, Bernard J. Hessley, Esq., and Susan Merritt.